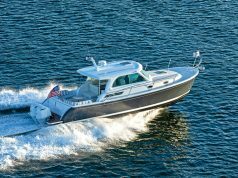 They don’t come much more traditional—or much better looking—than the Bruckmann Abaco 40, a single-diesel, straightforward, solid Downeast boat with elegant fit and finish. Built by Bruckmann Yachts near Toronto, Canada, and designed by Mark Ellis, the Abaco 40 is a single-stateroom cruiser with a Herreshoff interior and flowing lines that turns heads anywhere she goes. From the cockpit, you enter the fully enclosed salon/helm deck through two sliding doors. Bruckmann is a traditional sailboat builder, and the sailing lineage shows in the Abaco 40’s simplicity. The salon has two bench-type settees facing each other with a table in the middle—they convert to berths if needed. Matching Stidd helm and passenger seats are forward, and large windows provide excellent visibility all around. All the wood is exquisitely joined mahogany. There are no frills here, just seven coats of varnish. Down three steps a U-shaped galley is to port, with a large head and shower to starboard. A centerline berth is forward. 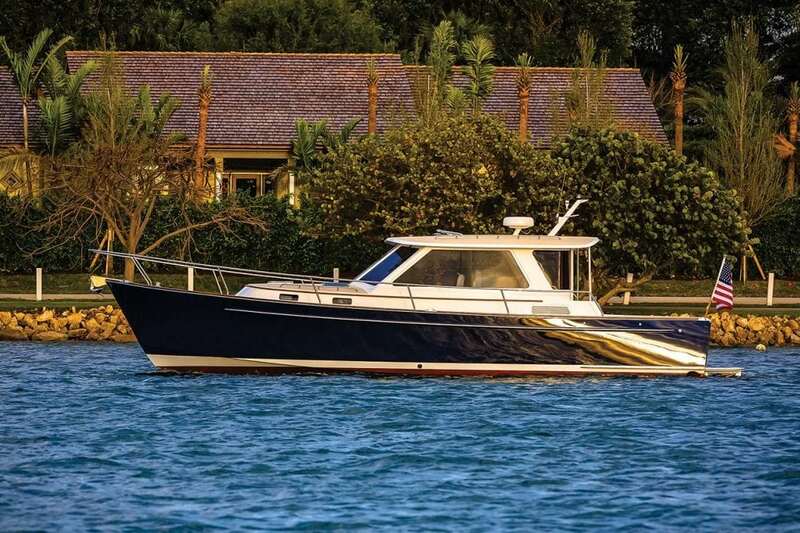 Ellis designed the hull with fairly flat aft sections and broad chine flats for stability. A sizable skeg and rudder protect the single prop and help with tracking. 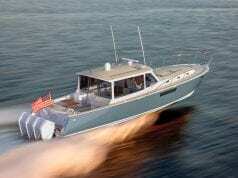 Bow and stern thrusters are optional. 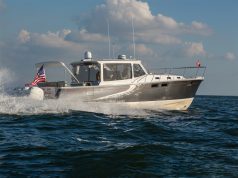 A 670-hp Cummins produces a cruising speed of 24 knots and a top speed of about 28 knots.